Mold Scam Alert! Homeowners Beware! In a perfect world you could trust everyone, but it’s not a perfect world. Like every industry, the mold business has its share of scammers and con men seeking to profit from your lack of knowledge about mold. Here are the top 8 mold scams and tips on how to avoid them. Mold Scam # 1: Mold Inspectors Who provide Mold Remediation. The worst perpetrators of mold scams are “mold inspectors” who are also in the mold remediation business. Mold remediation is a very profitable business. Many mold remediation contractors use free or deeply discounted mold inspections as a means to drum up expensive remediation jobs for themselves. This is a common scam that works almost every time if the mold remediation company does not have a independent 3rd party mold assessor. Remediators should have an independent 3rd party reviewing work to ensure cleanup is complete. How to Avoid It: If someone is offering a FREE mold inspection you should be cautious. Almost always a “Free” mold inspection will find mold which results in extra work. Mold inspectors should never base their opinion solely on the outcome of a laboratory report. The best way to avoid this mold scam is to hire an inspector who is not in the remediation business and ensure that the remediation company you hire is agrees to independent 3rd party review of ALL of their work. That’s the only way to ensure an unbiased inspection report. Mold Scam # 2: Free Post-Remediation Verification or Clearance Testing. The final step in the mold remediation process is a post-remediation verification inspection aka mold clearance inspection conducted to verify and document that the remediation was in fact successful. The post-remediation verification inspection should be conducted before any re-construction work begins so the mold inspector can visually see that there is no mold left on the remediated materials. Many mold remediation contractors offer “FREE” post-remediation verification inspections or clearance testing. The post-remediation verification inspection or clearance testing is vital to the mold remediation process. Insurance companies, mortgage lenders and prospective buyers of your property in the future will want to see written confirmation that the mold issue was resolved. Post-remediation clearance testing should never be performed by a mold remediation contractor waiting to get paid for his work. With thousands of dollars on the line, it‘s highly unlikely that a mold remediation contractor will fail his own work. How to Avoid It: The way to avoid this scam is the same as Mold Scam #1. Have you post-remediation verification or clearance test performed by an independent 3rd party Licensed Mold Inspector who does not work for your remediation contractor. Mold Scam # 3: Encapsulating Fungal Growth. Encapsulation is a trade term used by certain mold remediation contractors. The goal of encapsulation is to essentially cover or glue any remaining mold in place to prevent the release of spores. This is possible to do and may even be the preferred (or the only realistic or economic) method of choice is some cases. However, if you have fixed the water problem, dried the remediated materials and removed all of the mold growth, encapsulation should is not necessary. As a rule, encapsulation is not an acceptable stand-alone solution for a successful remediation project. For prevention purposes, there are now proven treatment products that work to prevent the return of mold to the newly installed building materials – these are not encapsulates as they are not designed to cover the mold. Deciding To Encapsulate: In the remediation process, contractors will scrape, sand, grind, and wire brush as much mold as they can from salvageable construction materials such as studs, ceiling and floor joists. At some point they determine that they have removed as much mold growth as possible for the amount of money they are charging you. At that point, if your contractor is confident in his work, he will inform you that your project is ready for a post-remediation survey and clearance test. If they are not completely confident that the job will pass a post-remediation air test, often times they will spray a sealant (or encapsulate) over the construction materials inside the containment area. There are four reasons why contractors decide to encapsulate: The Legitimate Reasons: He suspects that there may still be traces of mold left in areas that cannot be accessed without major demolition and encapsulating those areas will inhibit spore release. He suspects there is a possibility that moisture is still a factor in or around the remediated area and, as a precautionary measure, he wants to apply a water seal treatment to the salvaged materials to protect them from that moisture. When encapsulation is done properly by a responsible remediation contractor, the encapsulate product should always be clear so that a third-party Inspector can visually see the remediated materials in this post-remediation survey and confirm that no mold growth remains. When encapsulation is done to cover up a bad job, the contractor will use a solid color encapsulate product (typically red or white) to hide whatever mold they left behind, making it impossible for the Inspector to verify that all mold has been removed. Some unscrupulous contractors try to encapsulate with KILZ, which is just a stain killing paint with absolutely no anti-microbial properties or ability to encapsulate mold spores. Some actually use regular paint which insidiously provides additional moisture in support of the underlying mold issue – worsening an already costly situation. How to Avoid It: Before your remediation contractor begins, ask him if he intends to use an encapsulant and, if so, insist that whatever product he uses must dry clear. No solid color encapsulates and no KILZ. Secondly, before your contractor applies an encapsulant, ask him to take you into the containment area (the work area) and explain to you why he believes encapsulation is necessary. This is different than a professional contractor who has performed the necessary remediation and then applies a preventive shield – ask about their warranty coverage to uncover any suspect disclaimers or restrictive limits of liability. Tips on Encapsulation: Before encapsulation can be considered: Whatever water problem that occurred which led to mold growth must be corrected and unlikely to occur again. Mold will grow on encapsulating materials if the materials get wet. All mold growth has been removed from surfaces where it is possible to remove it. Encapsulating is not an alternative to mold remediation. The substrate or surfaces to be encapsulated must be completely dry. Otherwise mold will grow right through the encapsulant. Encapsulating mold growth may not be safe or an adequate safeguard where immune compromised people live. Encapsulating should be considerably less expensive than actually removing all of the mold contaminated materials. Encapsulation is not a permanent fix. Completely removing all of the contaminated material is always best. Encapsulates are very limited in their effectiveness and should not be confused with anti-microbial bonding agents that work specifically to deny mold spores the ability to grow by separating them from their food sources. Encapsulates, by their nature and design, leave mold spores in place on their food sources and are not effective in inhibiting future growth and damage. The goal of mold remediation is to remove or clean mold contaminated materials in a way that prevents the emission of mold and dust contaminated with mold from leaving a work area and entering an occupied or non-remediation area, while protecting the health of workers performing the mold remediation. The goal is not to kill the mold it’s to collect and remove it. The first step in solving an indoor mold problem is stopping the source of moisture. Next is to remove the mold growth. Next is the proper cleaning and removal of mold contaminated personal property and building material. The proper method is the collection and removal of the mold. Improper methods for cleaning mold include the application of fungicides and biocides to kill mold. These methods may render the mold non-viable (dead or incapable of growth); however, the mold and its by-products can still elicit negative health effects. The mold is still and allergen in your home until its removed. A mold spore is an allergen that may or may not have the presence of mycotoxins. Some of these mold spores have the ability to germinate and may eventually grow to be a colony. To prevent this we correct the moisture that was supporting the mold growth and wala the mold will not have the available moisture to grow. Now all we have to do is collect the remaining allergens (aka mold spores) and remove them from the home. If we simply apply fungicides or biocides to kill the mold so it won’t grow we still have the mold spore or allergen that may or may not have the presence of mycotoxins. But…the mold spores are still in your home, still an allergen, still have the potential of containing mycotoxins, and are now completely covered in a poison, just Wonderful. And the poisonous mold still needs to be removed. So to recap this scam; the mold remediation is sold as a process of killing the mold so it won’t harm you and that the fungicides or biocides are usually “Green”. However the mold will be left in your home right along with the fungicides or biocides. Your home will now have mold allergens and fungicides or biocides. Below are a few of the resources that address the use of chemicals for remediation. “The use of gaseous, vapor-phase, or aerosolized biocides for remedial purposes is not recommended. The use of biocides in this manner can pose health concerns for people in occupied spaces of the building and for people returning to the treated space if used improperly. The goal of remediation is removal of mold and the moisture source because: a) biocides do not alter mycotoxins or allergens; b) it is generally not possible to get 100 percent kill with biocides; and c) because of (b), the newly deposited spores, re-growth will occur after the biocides if moisture returns. “The purpose of mold remediation is to remove the mold to prevent human exposure and damage to building materials and furnishings. It is necessary to clean up mold contamination, not just to kill the mold. Dead mold is still allergenic, and some dead molds are potentially toxic. The EPA has not registered any products for sanitizing or disinfecting ductwork. Further, no fungicides are registered for use in ductwork. It is a violation of federal law to use a product in a manner inconsistent with its labeling. For antimicrobials, this law is the Federal Insecticide, Fungicide, and Rodenticide Act (FIFRA). Therefore, any claims of sanitizing or disinfecting ductwork would require the use of a product in a manner inconsistent with its labeling, which is a violation of FIFRA. 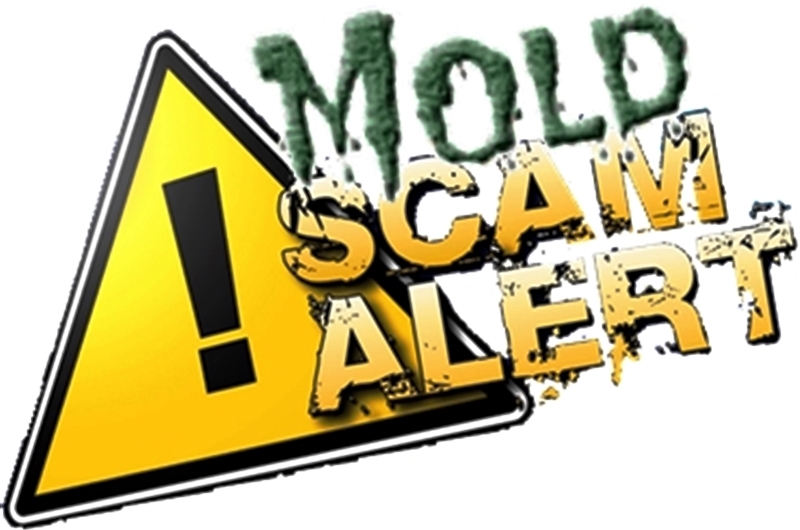 How to Avoid It: The best way to avoid this scam is to only hire State Licensed Mold Remediators that follow the S520 Standard and Practice for Professional Mold remediation. Always remember that the goal of mold remediation is not to kill the mold it’s to collect and remove the mold. Remember without the water the mold won’t grow. I would consider that the “Greenest” fungicides or biocides available. Many sellers of ozone generators have jumped on the mold bandwagon. Resellers and dealers of ozone generators make false statements about the ability of ozone air purifiers to kill mold. It is not true. False advertisements of ozone devices often use misleading terms such as “energized oxygen” and “pure air” suggesting that ozone is a healthy kind of oxygen. The fact is, ozone is a toxic gas with vastly different chemical and toxicological properties from oxygen. Claims that ozone generators sold as air purifiers are effective at controlling indoor air pollution are simply not true. Several federal agencies have established health standards or recommendations to limit human exposure to ozone. The U.S. Food and Drug Administration (FDA) has established an ozone level of .05 ppm (parts per million) as the maximum level allowable in an enclosed spaces. Relatively low amounts of ozone can cause chest pain, coughing, shortness of breath, and, throat irritation. Ozone may also worsen chronic respiratory diseases such as asthma and compromise the ability of the body to fight respiratory infections. Exercise during exposure to ozone causes a greater amount of ozone to be inhaled, and increases the risk of harmful respiratory effects (US EPA, 1996a, 1996b). Some manufacturers and resellers of Ozone Generators sold as air purifiers claim that these products help to control mold. According to the Environmental Protection Agency, however, (EPA) these products may very well add to indoor air pollution and even make indoor mold conditions worse. ozone is not even effective at removing odor-causing chemicals. In fact, results from controlled studies show that some ozone generators produce unsafe concentrations of ozone even when a user follows the manufacturer’s operating instructions. This entry was posted on Saturday, June 29th, 2013 at 4:49 pm and is filed under Commercial IAQ, Residential IAQ. You can follow any responses to this entry through the RSS 2.0 feed. You can leave a response, or trackback from your own site. 2 Responses to Mold Scam Alert! Homeowners Beware! This well written and very good article. Thanks for doing it.